You've probably come across a number of police vehicle equipment products in your lifetime that may have just looked like everyday items. But there is a wide variety of equipment that law enforcement agencies utilize on a daily basis in order to do their job effectively. Even as a civilian, it's important to keep these examples of police vehicle equipment in mind in case you ever encounter them. One of the most immediately regonizable are the police sirens that signal when an emergency vehicle is nearby. Many people take these for granted, but there are a number of requirements necessary for these to be deemed reliable. For one, most police sirens need to reach a certain level of sound in order to do their job effectively. It's important that the sound is always projected accurately so it's instantly recognizable, that way people can react accordingly. A fire truck, a police car, and an ambulance all have very distinct sounds that mean different things for those who hear them. In the past, sirens mechanically made the distinct sound we are all familiar with. While it was loud, it could only produce that one sound at that one particular volume. In the modern day, police sirens have become electronic and that's why you can project any kind of siren variation you want across much larger distances. Take a look at the above image. 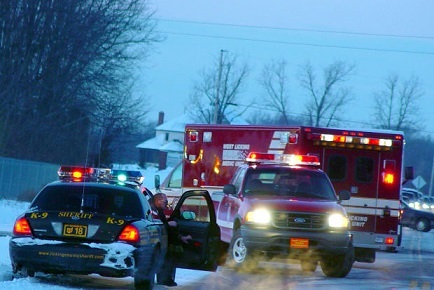 There are multiple law enforcement vehicles featured in this photo that each have different equipment requirements. For each, the siren sound they are expected to make is different meaning they require a different piece of equipment. It's important that the ambulance and the police car are louder as well since they are often responding directly to emergency situations. This is all accounted for in the electronic controls for each. Did you know there was so much to think about when considering police vehicle equipment. Thankfully, Darta Enterprises is an experienced provider of police vehicle equipment who has worked with numerous police agencies. If you have any questions about our offerings, please contact us directly. I didn't know there was such variety in police vehicle equipment at all!